Fresno Unified students continue to show growth, and slightly outpace the state, but too many students are still far behind. 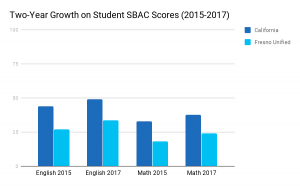 California released test score results for school districts across the state – the California Assessment of Student Performance and Progress, commonly known as SBAC – and the results leave us at GO Public Schools Fresno feeling urgent and hopeful. Despite so much of the positive work of Fresno Unified staff members and teachers, Fresno Unified continues to lag peers from across the state, often by large margins (see chart below). Despite averaging roughly 3% gains each of the last two years, we still have huge portions of our young people who are off grade level and will not be prepared for the next grade or to thrive beyond high school. The stark reality is that 2 out of every 3 students in Fresno Unified are not on grade level in English and more than 3 out of every 4 students in Fresno Unified are not on grade level in Math. 4% of English Language Learners are on grade level in English. 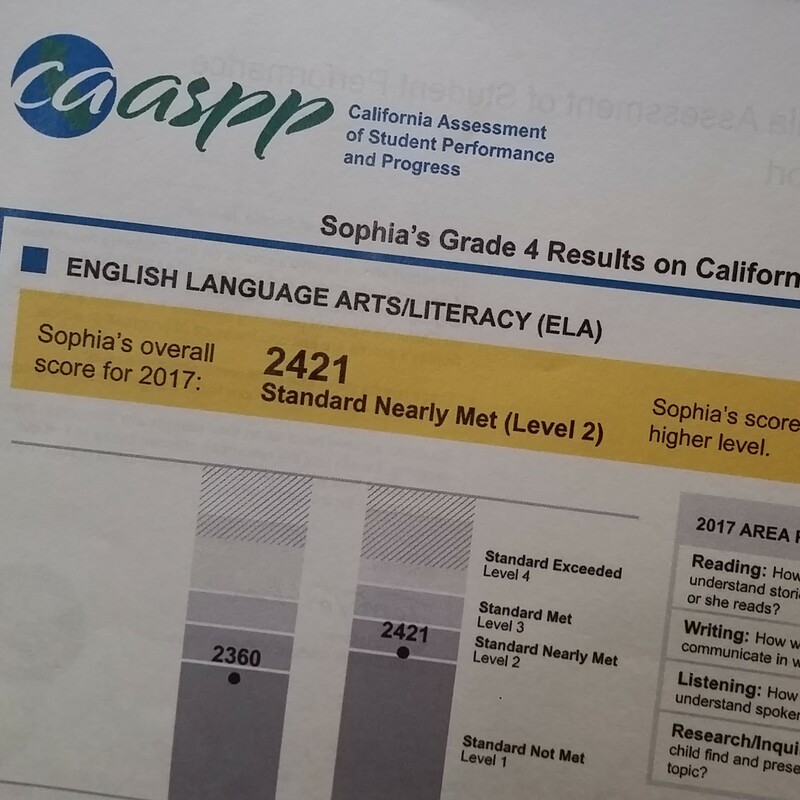 For 2017, an English Learner in CA was 3x more likely to be proficient than an English Learner in Fresno Unified. 5% of students with an identified special need are on grade level in English and math. For 2017, a Special Education student in CA was 2x more likely to be proficient than a Special Education student in Fresno Unified. 8.5% of African-American students and 12% of Latino students were deemed “ready” or “conditionally ready” for college math in 2017. 2,408 (of more than 2752) Latino seniors are not ready for college. 424 (of 537) Asian seniors are not ready for college. 370 (of 400) African-American seniors are not ready for college. 300 (of 417) White seniors are not ready for college. When 2 out of 3 students are not on grade level in English and 3 out of 4 students are not on grade level in Math, we cannot do the same thing and expect different results. Changes that will improve these outcomes must happen at individual schools across the District, classroom by classroom. From 2016 to 2017, 29 schools saw declines in test scores in either English or Math. During that same time frame we saw some shining examples at individual school sites that leave us hopeful. In almost every one of these examples educators were provided with an ability to create a unique learning environment to better meet the needs of individual students. More than 70% of students at Phillip J. Patiño School of Entrepreneurship were deemed “ready” or “conditionally ready” for college English. Two elementary schools – Burroughs Elementary and McCardle Elementary – increased test scores by more than 10% in English and Math from 2016 to 2017. More than two dozen schools increased test scores by more than 10% over a two-year timeline. Dailey Elementary Charter School was the only public school without entrance requirements to ensures that more than 3 out of every 4 students were on grade level in math (78.5%) and English (85.3%). We hold no illusions about the difficulties we face; if solving this issue were easy, we would have done it long ago. We know this isn’t easy work. To push beyond incremental gains and dramatically close the achievement gap we must re-think core components of our basic school model that have remained stagnant for more than one hundred years. Most of the schools who have shown the most promise in Fresno Unified have been allowed to do just that. We are excited to learn more about what’s working and to help create the conditions so more schools can follow their lead. We are committed to continuing to engage hundreds and thousands of Fresnans to stand with us as we work to ensure every one of our children can thrive in school and in life. If you are interested in joining the conversation, learn more about the work we’re doing with Choosing Our Future 2.0 and let us know here if you would like to host or attend a house party conversation.